This is an easy grilling recipe and has nice South of the Border flavors. If you’re a Real Heat Lover, top your Green Chile Burger with the Grilled Jalapeno’s. Add Grill Spuds for a balanced meal done on the grill in the backyard or camping trip. In a mixing bowl add ground beef and spice to your own personal taste. Form the ground beef into three large hamburger patties. Drain one can of Green Chiles and put them into a small 5″ Dutch Oven. 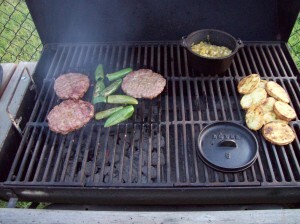 Place the Dutch Oven inside the grill to heat the Green Chiles while grilling the hamburgers. The hamburgers should be grilled until medium well to well done flipping only once. 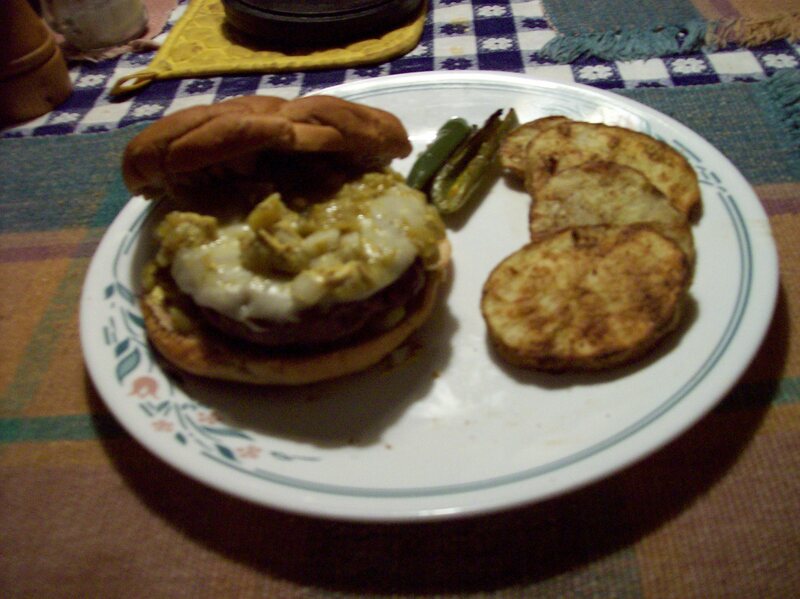 During the last few minutes of grilling add the Provolone Cheese and the desired amount of Green Chile to the hamburger patties. The bun can be lightly toasted on grill if desired. Top with Lettuce and Tomato. Wash and dry the Jalapeno’s. Cut in half lengthwise and remove seed. Be careful handling the peppers. Do not touch your eyes afterwards or wear latex gloves during handling of the Jalapeno’s. Lightly oil and salt the Jalapeno’s, then grill next to the hamburger patties. Fiery Peppercorn Steaks have become very popular. Here’s a recipe we think will capture those flavors. This is a simple recipe that can be done in the backyard or on a camping trip. The Steak Rub can also be sprinkled on hamburgers and blackened or mixed in the meat while forming patties. Yum! We like the heat. Let the steaks stand at room temperature 30 minutes prior to grilling. Mix the peppercorns, 1 tsp chili powder, salt, light brown sugar, garlic powder and 1/4 tsp onion powder together well in a mixing bowl. Coat both sides of the steak with the peppercorn mixture being sure to press into the meat. Lightly brush or spray both sides of the steaks with the olive oil. Prepare your charcoal for a high temperature. In a saucepan over low heat simmer together the ketchup, Worcestershire sauce, wine vinegar, dark brown sugar, 1 tsp chili powder, 1 tsp onion powder, pepper and water. Allow to simmer 10 minutes being sure to stir often to insure the brown sugar dissolves completely. Grill the steaks 12 minutes, 6 minutes on each side for medium turning once during grilling time. Allow steaks to rest 10 minutes before serving. Pour the sauce over the steaks before serving or use as a dip on the side. Using kosher salt will insure that the salt cooks into the food instead of being washed away by the juices as would regular table salt. If you would like to use regular table salt reduce the amount by half. The sauce for the steaks could be made in a small Dutch Oven inside your grill or in a fire pan with a few charcoals around it. Try some Grill Spuds next to your steak for a complete meal.